The depth and breadth of poverty in First Nations children and families in Canada is staggering. First Nations children under 6 years of age living off reserve are more than twice as likely to live in low income families as compared to other Canadians. First Nations children have the added burden of racism, assimilation policies and funding inequities. They are two and a half times more likely to end up in child protective custody for neglect. 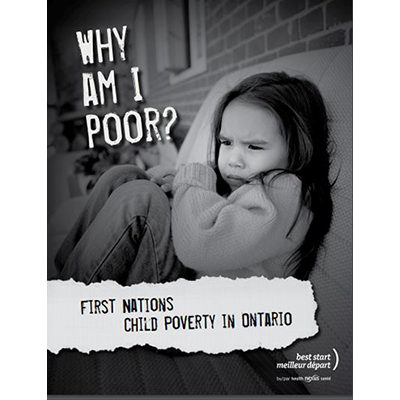 The purpose of this report is to help service providers understand the context and history of First Nations child poverty. It also provides information on how to work with and advocate for First Nations families. Practical, culturally relevant and effective strategies to support families have been included to help service providers reduce both the impact and the rate of First Nations child poverty. Information is also provided on ways to support front-line staff working with vulnerable First Nations families.